One question in trying to understand how campaign coverage is shaped involves identifying who is driving the master narratives about the candidates-who are the sources for these themes. What we find this year is that campaigns, their surrogates and partisan allies are becoming a larger source of the messaging in the press about the candidates while journalists are becoming a smaller part of where these narratives come from. This shrinking has been gradual over the years, but it is unmistakable. 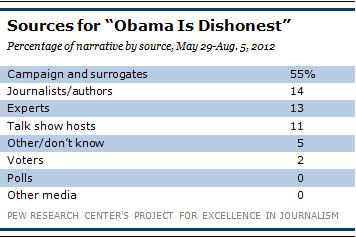 In all, just under half of the narratives about Obama and Romney-48%-came from partisan sources this year. That includes the candidates themselves, their campaign surrogates, political allies, super PACs and political ads. Journalists were the source of 19% of these assertions and another set of media voices, talk show hosts on TV and radio, were the source of 8%. Outside experts accounted for 10%, polls 6% and voters 5%. This marks a sharp rise in the influence of partisan voices, spin doctors and surrogates in shaping what the public is told about the biography and the character of the candidates. The numbers for journalists are down by almost half and the numbers for partisans are up substantially from what we found in 2000, the first year we began to analyze character narratives in the media. That year, fully 50% of the character narratives came from media voices, journalists and talk show hosts, though there were fewer such programs then. 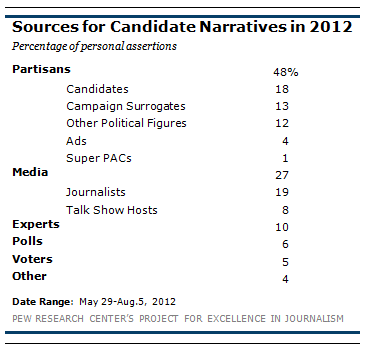 Campaigns and surrogates accounted for 37%. In 2004, the last time an incumbent president ran against a challenger, the campaigns and their allies were the source for 39% of the assertions about character and record in the coverage, as were journalists and hosts, also at 39%. Four years ago, in 2008, partisans had begun to have a bigger role, accounting for 46% of the assertions, but journalists also played a bigger role than now (28% vs. 19% today), while talk show hosts were about the same (7% vs. 9%). While the sample of media has evolved over the years-there was no web component studied in 2000, and cable news shows come and go-by and large the samples are fairly consistent and reflect the media of their time. If anything, the samples of 2000 and 2004 might have involved more opportunities for campaign surrogates because they included Sunday interview programs. The shrinking role of journalists in shaping the master character narratives of the candidates more likely reflects diminishing reportorial resources in newsrooms and more reliance, on television in particular, of live interview formats in which partisans are invited to deliver campaign messages. In 2000, cable programs also were more likely to involve panel debates in the style of Crossfire, the old CNN program. Today, more programs involve one guest at a time. If the groups are broken down into components, journalists are still the largest single one, at 19%. But they are followed closely by the candidates themselves (18%), and then campaign surrogates (people officially representing the two campaigns) at 13%. Interestingly, 41% of the time that these surrogates appeared they were anonymous or on background, meaning a formal staffer was allowed to talk about a candidate without being named. That ratio is higher from what we have found in the past. In 2004, for instance, 33% of the assertions from were unnamed. Inside these numbers, there is a good deal of variation depending on the theme. The largest narrative in the race so far, that Obama has not done enough to fix the economy, has come largely from the Romney camp. Fully 57% of this charge originated with Romney, his campaign, his ads or GOP allies. Another 11% came from talk show hosts. And 10% came from journalists. The same was basically true for the No. 4 narrative about Obama, that he lacked honesty and integrity. Fully 55% of that narrative originated with the Romney campaign and its surrogates, including Romney’s advertising-which was cited in 13% of those assertions. 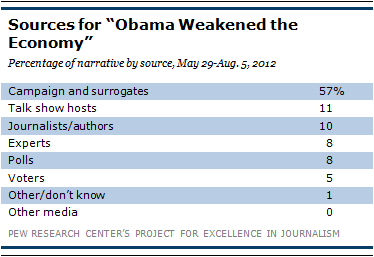 Another 25% came from journalists and talk hosts. When it came to the biggest positive narrative about Obama–the counter theme that he has protected the economy from a worse fate-the reverse was true. In this case, Obama’s own campaign, ads and allies were the source for 54% of those assertions in the press (Another 2% came from Republican sources). The second-largest source, at 15%, was outside experts who commented in the media. 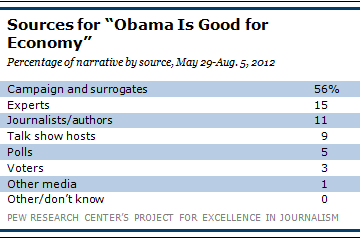 The sourcing for one of the more subtle negative narratives about Obama was different. The idea that Obama doesn’t believe in capitalism and its notions of success was driven in substantial measure by media voices. Here, the journalists and talk show hosts accounted for 40% of that narrative, only modestly less than the 46% that came from the Romney campaign and its allies. Some journalists seized on remarks by the president himself, such as his June 8 comment that "the private sector is doing fine." "President Obama’s assertion that the private sector is doing fine was no gaffe," asserted Fox News analyst Brit Hume, on June 11. Rather it reflects "his clear belief in the primacy of the public sector over the private." Obama later acknowledged that the economy "is not doing fine." 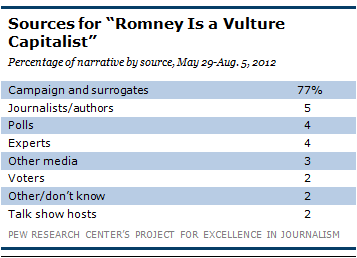 When it came to the top two narratives about Romney, the related themes that he is a vulture capitalist and a wealthy elitist, the sources differed markedly. The Obama campaign and its allies were the primary source on the theme of vulture capitalism, accounting for more fully 76% of the assertions in the media driving this narrative. (Another 1% came from Republican sources.) 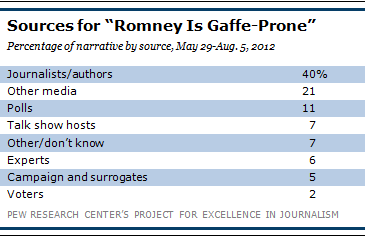 Journalists, talk show hosts and outside experts, interestingly, combined to add another 10%, a number some might consider low given that this theme involved examining Romney’s record. Much of the idea that Romney is an awkward, gaffe-prone campaigner stemmed from his closely watched trip overseas in late July. 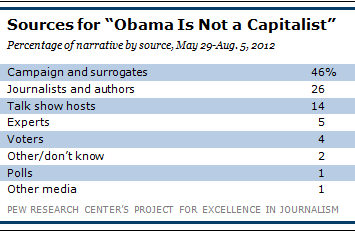 Journalists accounted for 40% of that narrative, and talk show hosts another 7%. Another 21% of that narrative came from one media outlet directly citing another press source, in this case, the overseas journalists who were covering Romney’s trip. When Romney professed doubts about security at the London Olympics, the British press seized on the stumble and the American media in turn quoted them at length. Romney’s comments about the lack of preparedness in London "set off a firestorm with the British press," ABC correspondent David Muir reported July 26. "On television here, it’s the lead story." The debate over Romney’s ability to fix the economy, meanwhile, was waged between the campaigns using the press as a conduit. More than 60% of the narrative making the affirmative case for the Romney’s economic acumen came from the Romney campaign and its allies. 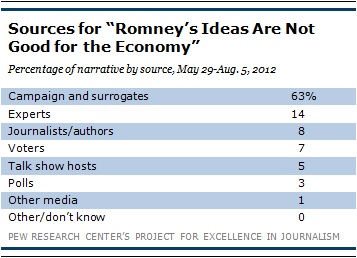 Almost two-thirds of assertions arguing that Romney’s ideas would hurt the economy (63%) came directly from the Obama camp. In both cases, independent outside sources play a role, but a much smaller one. 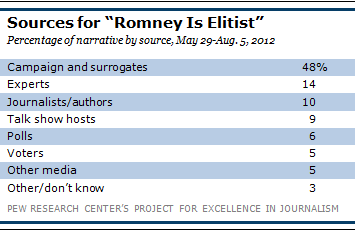 Public opinion polls were a significant source of assertions for Romney’s positive economic narrative (12%). 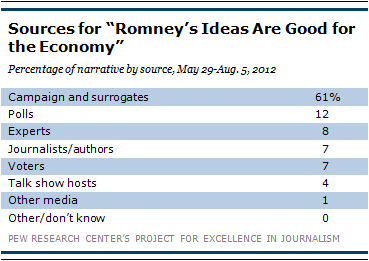 Experts, on the other hand, were a sizable source for the idea that Romney’s policies would hurt the economy (14%).